SQUEE, PEOPLE. SQUEE FOR YOUR LIVES. Also Sasha, woot! New page, woot! Continuation of RotW? Probably not, but still woot! 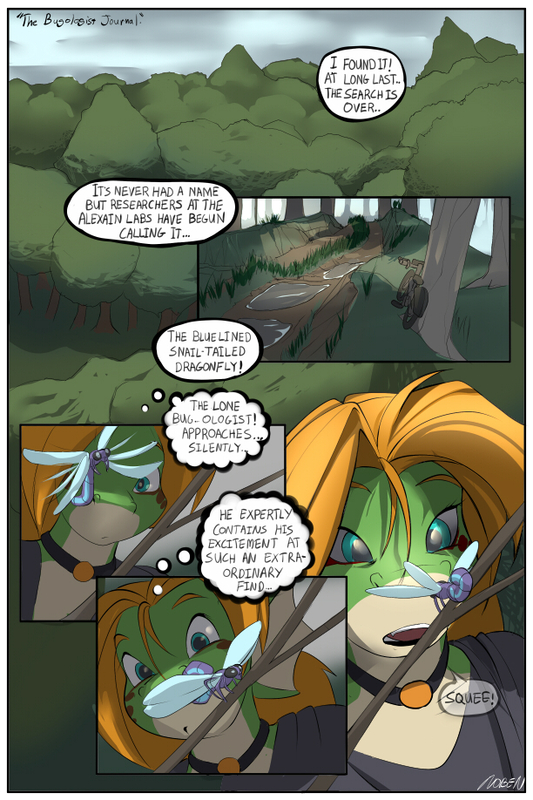 I'm guessing Casey still has a lot on her plate and/or isn't as invested in the comic much now due to the quality, in comparison to her previous pages that she's put out. Not that it's bad in the slightest, just making a note. DISREGARD THAT I'M AN IDIOT. I am pleased that there's a new page! What a purty little Odonata! I'm thinking this is looking good! Noben does change her art styles now an again. Truthfully, I'd be okay with a greyscale comic, though I do love her coloring work! I'm just happy to see the next page at any rate! I suspect Noben being in a better location will be a boon to the comic, and certainly to Noben! I sense a SUV approaching crushing poor dragonfly. I think that has a very good chance to happen, or something like it. Not that it's bad in the slightest, just making a note. I am pleased that there's a new page! Hey, you hurt Casey's feelings. She put a lot of work into this page and she hand lettered it, agonized over it. She'd like something a little more supportive than that for the first effing comment. You should know better than that. This IS a continuation of RotW, it's the next damn scene! Sasha's supposed to be there! Think before you post, you really hurt her! I have to say, I noticed the hand lettering and it looks awesome! (I wish *my* handwriting could be that good). I think the difference I notice in coloring might be a greater contrast with the shadows and highlights, but I think it looks great. I don't have too much to contribute. I don't ordinarily comment on stuff like this, but I thought maybe our miss Casey might appreciate it. I can definitely see the effort she put into the page, and I really appreciate the hand-written dialogue. Many people use already existing 'handwritten' typeface so it has that personal touch, or use their own handwriting to create the typeface. Not only does it make it easier to keep everything neat and organized, getting the alignment of each line centered just so is soooooo difficult by hand. Going through that extra effort to do it all by hand is really something else. I sometimes go through several pages of retries before I find something appropriate. I love the deep-forest path and the little winged cutey, and I think Sasha's expressions are great. Especially the last one :3. I do have a bit of a bias towards forests and nature, though, haha. Anyway, before anyone blows up at anyone, let's try to remember that the best outcome is the one where, in the end, everyone is happy at heart. ...Oh sugar. Apologies indeed. Not much I can say to remedy what's been said, but I am truly sorry. No offense was meant, just noted the colouring wasn't what we usually see. On a closely related note I SQUEEEEEED so hard when I loaded up the comic and saw a new page that I thought my eyes were going to bleed. Sasha's big eyes will fill my heart with gentle squee whenever I gaze on this page, which will be often. I second this. This is now one of my new all time favorite pages of Altermeta. The colors, the spotty forest lighting, Sasha's expressions, the flow of the panels, and the cadence of the whole thing are all just spot on! I also really like that progression in the last three panels of Sasha slowly stepping closer into the light. It really gives a feel for how he's slowly moving to follow that dragonfly. Speaking of which, Casey, that last panel would make the most epic avie next time you feel like changing it!